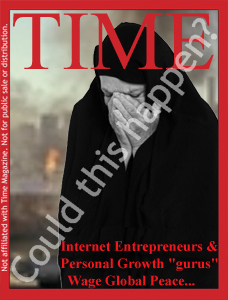 What a fascinating idea...why not use the power of Internet marketing to create world peace? With a HUGE pent-up demand for peace, and minimal hope of creating it the way world leaders have gone about it, 22 months ago, a small dedicated group saw a glimmer of something that drove them to give up their lives and businesses. They recognized a way to build a "viral peace-making" machine. What they saw was a vast untapped opportunity to positively influence the course of human history with a remarkable combination of tools. Those tools would help millions of war refugees rebuild their shattered lives. The tools would deliver peace-creation knowledge to anyone with an Internet connection--without cost--from the world's top speakers, authors, and peace experts. They would teach adults and children how to create personal peace in their lives, their jobs and their communities--the kind of lessons we all should have learned in grade school. The project, called "10 Million Clicks For Peace," was founded by Julian Kalmar, creator of The Happiness Formula, and Rick Beneteau, perhaps best known as one of the early Internet marketing pioneers and founder of the Internet Toy Drive. To date, over 5,900 volunteers have donated their time and effort to this humanitarian project. "Peace in its most fundamental form is the connection of one human spirit to another. 10 Million Clicks For Peace hastens the connection process. What a beautiful and remarkable concept!" I believe with all my heart that this is the most important project I'll see in my lifetime, and I'm convinced you'll feel the same way by the end of this letter. Let me start by asking you this . . .
Are you tired of watching news of war, terrorism and turmoil, and the politicians and world leaders who seem powerless to do anything about them? Do you yourself feel helpless in the face of these major problems and wish there was something you could do about them, if not for yourself, then for your children? If so, then what follows is the most amazing evolution of thought that applies the power of the Internet to the problem of world peace, and oh what a brilliant, brilliant combination of ideas that have come together to address the problem. Now we can change the news instead of helplessly watching it! More powerful than your political vote has ever been, you can now positively impact tens of thousands of lives in a way that you can see and measure in real time, right before your eyes! creates peace on a scale previously inconceivable. The current problem with peace efforts is that they are attempted by high-level government officials without regard to the grassroots causes. The turmoil we are experiencing in the world today, proves that this method is unable to create peace. The reason it fails is because governments are powerless to create peace when their citizens are in a state of turmoil. "10 Million Clicks For Peace is a beautiful expression of our infinite creative potential. We are free to create peace for ourselves...and now it's as easy as a few clicks. citizens, not just their leaders. 10 Million Clicks For Peace does just that, and the reason it's the best hope we've got, is that for the first time in history 1-out-of-5 people in the world can directly participate in the peace process...not just government officials. Why 1-out-of-5? Because that's how many of the world's people are connected to the Internet. The Internet--which was ironically envisioned to permit communications after a nuclear war--is now the most promising tool we have for the creation of world peace. You and I can now reach out to all the people we know, and they can do the same, and on and on, until everyone in the world has access to the tools for creating personal peace. start wars or participate in violence. Imagine living happily, with harmony in your home, your work, and your neighborhood. Violence would definitely reduce your happiness, and you wouldn't want any part of it, would you? Now imagine if every neighborhood in your country was living happily, do you think your country would stand a chance of creating, or, participating in a war or other violence. Who'd do the fighting? Certainly not its citizens...why would they ruin their happiness at the request of their government? No way...forget it. peacefully is available to every world citizen. 10 Million Clicks For Peace gives everyone a chance to create a happier, healthier, and more successful life, courtesy of the world's great teachers of peace, happiness, and success. For the first time in history, the entire world can learn what should have been taught in every school from kindergarten on up...how to live vital happy lives, in harmony with ourselves, our families, our neighbors, and our co-workers. The world's largest personal growth course is available to everyone, and, at no cost! "10 Million Clicks For Peace is a mission of the highest human spirit and contains a most remarkable mechanism for creating world peace." To create peace, you must heal the damage already done! 10 Million Clicks For Peace is providing food, shelter, clothing, medicine, and HOPE to millions of war refugees around the world--the innocent victims of other's non-peaceful thoughts and actions. Just so you know, donations go to the 'Clicks for Peace Fund' administered by We, The World 501(c)(3) to support worldwide refugee assistance programs and sponsor peace education. As you may know, We, The World is advised by such notables as Nobel Peace Prize winner, Archbishop Desmond Tutu, Marianne Williamson and Dr. Jane Goodall, DBE. You can click here to see how donations are handled. Do you know the idea of 6-degrees-of-separation, where everyone is connected to everyone else through a chain of no more than 6 other people? If you want to reach your government official, you might know a friend, who knows an attorney, who knows a senator...etc. It's a powerful idea, and the folks at 10 Million Clicks For Peace have empowered you to reach out to the whole world through an ingenious referral mechanism. Imagine a gauge or meter that could instantly show you how your positive actions are spreading out into the world, affecting hundreds of people, and then thousands. It would be a magical kind of meter that allows you to follow along to see how your positive messages affect one person after another. Well, today, that meter exists. This patent-pending technology is called a Personal Peace Impact Meter, and it measures--in real time--9 positive effects each member is causing in the world. You can actually see the numbers change right before your eyes as you take positive action. But, it gets better... When the people you influence tell other people, the positive effects they create show up on your Personal Peace Impact Meter too. The Personal Peace Impact Meter reports back to each member the total effect as friends tell friends who tell friends, on and on for endless generations! And, they are very eager to do so! Many wise teachers talk about making a small effort to make a big difference in a person's life, but what if you could make a big difference in tens of thousands of lives with that same, small effort? 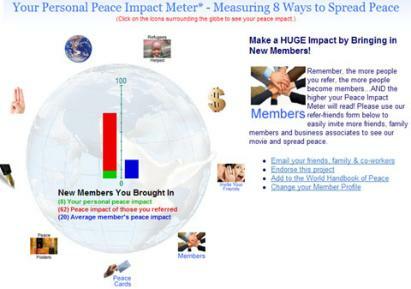 And the Personal Peace Impact Meter will show you just how many people you're helping! phenomenally multiplies your peace-making ability. Integrated into the website is the same kind of referral technology that built MySpace! So, every person you reach, and all the people they reach, and on and on, can, with just a few clicks, send every person in their instant messaging, regular email and web-based email address books, a special email about 10 Million Clicks For Peace! Instead of referring just a handful of friends, each person you reach will be contacting hundreds of others - and it all gets tracked on your meter! "10 Million Clicks For Peace has the distinct ability to...lighten the burden of peacemakers everywhere. Using technology for the good of humanity is something I believe in strongly and therefore have no hesitation in endorsing this program." If you want to watch our front-end movie to see the same introduction your subscribers will, just click here. After the movie, they'd move forward to membership signup, refer friends (optional), donate (optional), and log in to their own Personal Peace Impact Meter to start creating peace. Now, think about this...two weeks after launching 10 Million Clicks For Peace, one member moved 3520 people toward greater peacefulness, and raised $9,089...enough to shelter and feed 1,818 war refugees for one day! That's just one member, and your list is probably many times larger than theirs! ...if you want the troops to return home...if you want to stop the bloodshed...if you want to teach the next generation how to live peacefully...if you want to create a better life for millions of war refugees...if you want to create a better life for you and your loved ones...then join the world's largest virtual peace movement and become a VIP Peace Promoter. Join the many other members of the personal growth community who are right now starting to reach out to millions of subscribers, members, customers and fellow list-owners in a massive worldwide peace outreach using this most revolutionary peace-making technology. It's time to change the news instead of just helplessly watching it! There is great hope for our future. Join us right now! P.P.S. You will have the opportunity to contribute your life wisdom to our ecourse and blog, receiving massive exposure for your products and services. P.P.P.S. Feel free to download an overview of 10 Million Clicks For Peace.